The Greek chain of cosmetics DUST + CREAM has been awarded as «BEST URBAN FRANCHISE» by the administration of FRANCHISE Awards 2016 held under the supervisionof the Commercial and Industrial Chamber of Athens, the Greek Confederation of Trade and Entrepreneurship and sponsored communication by SBC Business Channel. DUST + CREAM chain excelled by far among all the chains that participated in this year contest amid adverse conditions for the economy and entrepreneurship. The shops DUST + CREAM, widely known as the chain of Greek cosmetics, following the trends of the modern market and always having as a basic slogan the moto «best value for money» products, continued its upward trend by constantly creating new outlets. Within a period of about 3 years, we have expanded our network of branches in more than 35 outlets nationwide today by targeting within the next 2 years, to increase our stores to a total of 50-55 stores in Greece. At the same time, the 2-year Master Plan , predicts the development of our network to selected foreign markets. This award confirms the growth potential of the Greek business model, even when operating under a difficult economic environment and carries a messages of hope for the near future. 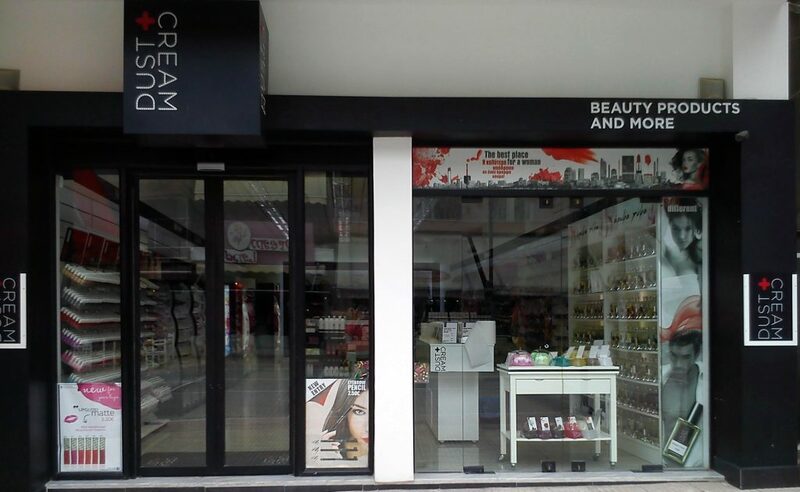 Shops Dust + Cream “beauty products and more”, is a new Greek chain of cosmetics stores that started in 2012. Today is growing rapidly throughout the Greek territory. Our stores are located in Athens, Thessaloniki, Piraeus, Patras, Larissa, Chania, Veria, Trikala Komotini, Kavala, Drama, Corfu, Syros, Katerini, Argos, Nafplio, Kalamata, Chios, Samos, Tower, Florina, Nea Moudania, Alexandroupolis Tripoli and Chalkidiki Kallikratia and growing rapidly. The concept of the stores, which numbers a range of over 5000 codes in makeup, perfumes, creams, cosmetics and personal care is to offer quality products at affordable prices that are perfectly adapted to the needs of the times and the wishes of the modern woman. We are constantly looking for new opportunities worldwide, so do not hesitate to contact us to discuss business options for your territory. Dust + Cream “Beauty products and more” is a new concept of beauty stores, with big potential both in Greece or abroad. We offer you more than 5.000 SKUs in makeup,perfumes, cosmetics, creams, nail polishes and personal care items. Every woman can live its dream of absolute beauty in the friendly and hospitable environment surrounded by well trained personnel while getting the best of advice concerning her daily make up. Our constant quality and low prices guarantee you will leave our shop prettier and happier.